Prague has been waiting four years for the return of American DJ and producer DEORRO, the author of the worldwide megahit “Five Hours”. Deorro last visited the Czech Republic in 2014 and now he returns with his unique show and original inimitable style to the hottest club with the best sound in Prague, DupleX, The Rooftop Venue, on Wenceslas Square launching the new concept night DUPLEX PRESENTS, which guarantees the biggest stars of world electronic music right here in the center of Prague! In 2014 Los Angeles native Deorro was the highest new entry spot on DJ Mag’s Top 100 list, and since then he’s become one of the most soughtafter producer/DJs in the business. The young house prodigy has amassed an awe¬inspiring discography including a cache of collaborations and remixes with Steve Aoki, Chuckie, Axwell, Krewella, Laid¬back Luke, Carnage, Diplo, MakJ, Tommie Sunshine and R3hab, as well as more originals than even the most devoted DJs could spin in a week. Deorro is one of Spotify’s top 140 most streamed artists in the world. In 2015 Deorro teamed up with famed R&B singer Chris Brown to release “Five More Hours,” a vocal version of his already impressive instrumental record “Five Hours,” which has been certified gold in 19 countries. Although Deorro initially came to worldwide attention due to his prodigious catalogue, neither he nor his music exist in a vacuum. Equally as impressive as his studio chops is his technique behind the decks. Deorro has showcased his unique grasp on modern dance music the world over, headlining his own US and European tours to throngs of mesmerized fans. Whether in front of 50,000 revelers at the Coachella Valley Music Festival, or at Tomorrowland Belgium and Brazil, Deorro’s fusion of Dutch, moombah, progressive and bass elements illicit revved and raved up reactions without fail. Deorro’s fast growing and fiercely loyal “PandaFam” fan base is a testament not only to what he’s accomplished in the past few years, but more importantly to the prolific music and moments that are on the horizon. When not spending time on his own music, he is busy with his own PandaFunk label where he’s signed some of the newest upcoming acts in the business. At the young age of 26 Deorro has already accomplished so much, but his musical prowess and undeterred drive signal there’s much still to come from the game¬changing music¬maker. 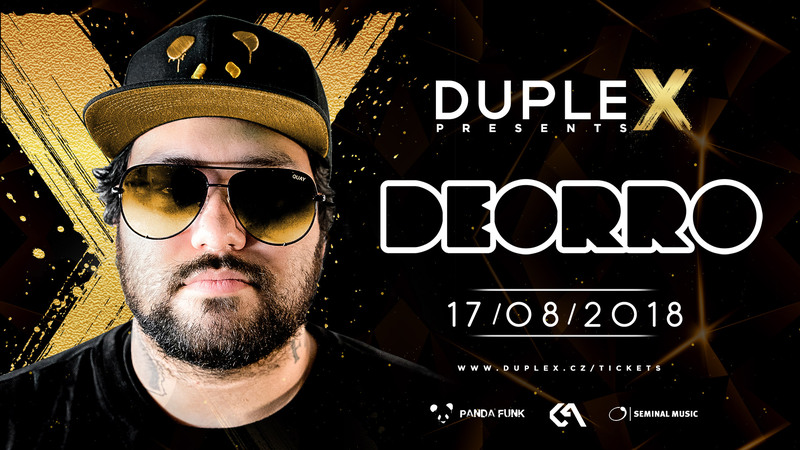 We cannot wait for Deorro’s 2018 debut on 17th August in DupleX, The Rooftop Venue, Prague!